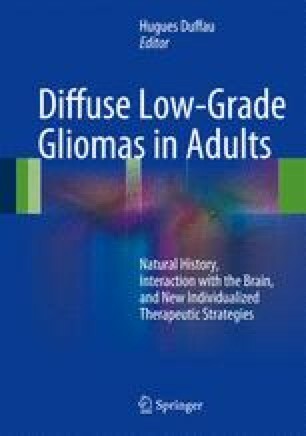 Adults harboring a diffuse low-grade glioma (DLGG) present most of the time without evident cognitive disorders. Nevertheless, extensive and specific cognitive assessments often highlight disorders in cognitive functioning, especially concerning memory, attentional resources, and information processing speed, which may affect negatively quality of life. Therefore, whatever may be the chosen therapeutic option, cognitive functioning must be assessed longitudinally in all patients. Such a longitudinal assessment may provide significant information about tumor progression, on the one hand, and allow to put the bases of a cognitive rehabilitation program if needed, on the other hand. We report here a proposal of language and other cognitive evaluations, these latter encompassing attention, memory, executive functioning, but also social cognition, in the context of patient care (perioperative evaluations) and in the context of longitudinal follow-up. This proposal is based on our clinical practice with DLGG patients, keeping in mind that cognitive functions interact with each other. Finally, we underline that a relevant cognitive evaluation should encompass both objective and subjective scales and be associated with a psychological support.